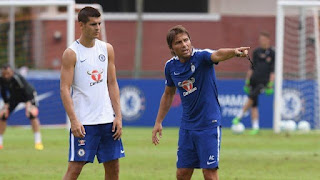 Chelsea Manager Antonio Conte has revealed he was mad at Alvaro Morata for his display in the game against Norwich City. "There was frustration for the first yellow card because he didn't deserve it. It's not right to book him." "You must learn to control yourself because the second yellow card was for dissent." "I agree with the player for the first yellow card but can't with the second." "For the striker in this situation it can happen. Alvaro this is the first season that's he's having a full season, maybe for him this is the first time to face these type of problems." "He has to overcome this problem because it is stupid problem. The most important thing is to work for the team and not lose confidence." Morata has not scored in Chelsea's last three Premier League game and he has also scored just three goals in his last ten league appearances. It is already looking like a bad season for the Spaniard and frustration are being to set in.